Taking Tea by Hoffman Media. I can send it on to the publisher. This is wonderful! 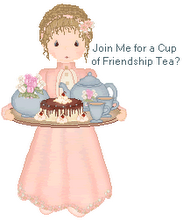 However, I haven't received your email, and when I tried to send to Linda@friendshiptea.com, it wouldn't go through. Can you email again? You may contact me at the email at the top of my blog.